Nearly every industry holds a trade show or in many case multiple trade shows throughout the year. This means there are literally thousands of trade shows taking place throughout the year in No. America and when expanded globally, this number increases by several multiples more. There are many huge shows attracting thousands of vendors. Want to differentiate yourself and increase your exposure? Buy custom wristbands promoting your company and its products from Amazing Wristbands. If you are a vendor at one of these events or the multitude of other covering nearly every industry, drive traffic to your booth by handing out custom wristbands. Amazing Wristbands can create a conversation starting wristband to help you differentiate yourself and your product offering. Why Buy Trade Show Wristbands From Us? Amazing Wristbands is a leading provider of customized silicone bracelets available online, including wristbands with your customized company or product name and brand. Our wristbands are comfortable, durable, and non-allergenic. 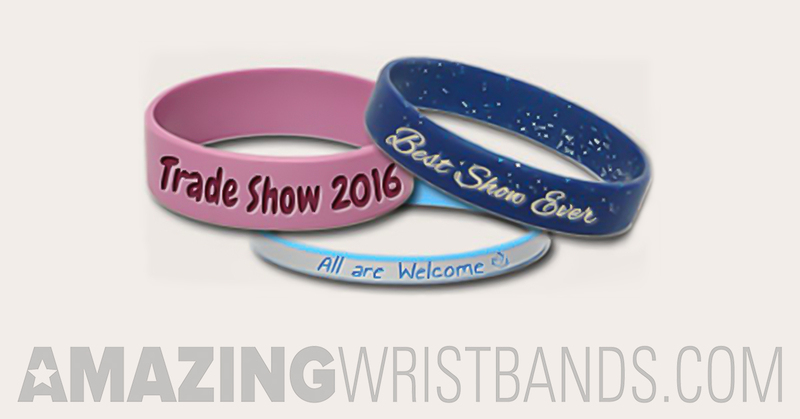 Our professional and friendly customer service agents will help you build your customized, fun trade show wristbands. We offer a wide variety of types and colors to help your brand stand out and make a difference. In addition to standard wristbands, we also offers slap bands, adjustable bands, USB bands, silicone rings and silicone key chains. FREE Shipping for trade show wristbands in the U.S.
Get a detailed quote for your trade show wristbands in minutes or order today at AmazingWristbands.com!